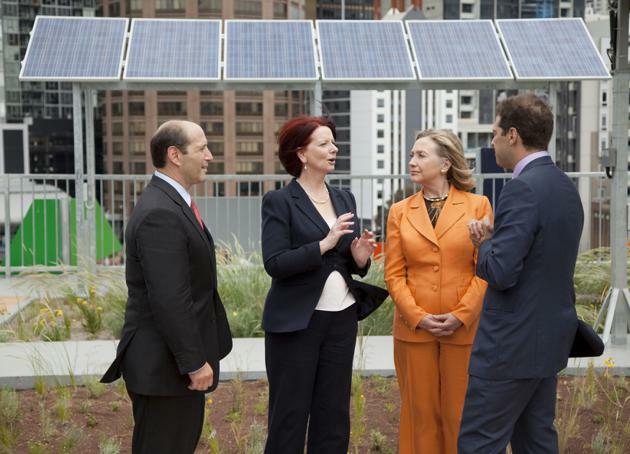 How Green Is Hillary Clinton? With her mixed record on environmental and energy issues, and her cautious silence on controversies like Keystone, activists can't help wondering. When Hillary Clinton kick-started her second presidential campaign on June 13 at New York's Roosevelt Island, environmentalists were all ears—and so were environmental reporters. For weeks, I'd been pestering Clinton's Brooklyn-based operation for information about her environmental platform, to no avail. Clinton had said little about climate and energy policy thus far in her campaign, beyond a few shout-outs on the economic benefits of continuing to grow the U.S. renewables industry. She had, to be sure, been talking about the need to address climate change for two decades, and she'd initiated clean-energy programs as secretary of State. But she had yet to take a stand on two of the hottest environmental issues of the moment—approving the Keystone XL pipeline and opening Arctic waters off Alaska's coast to drilling—much less to roll out an ambitious plan for carbon reduction or green energy. The day before the big speech, I did get an email from a Clinton aide: a long memo making the case that Clinton had an impeccable green record as New York's junior senator, and at the State Department. This was brute-force political messaging: more than 4,000 words of excerpts from press clippings and speeches, grouped under headings like, "Made Climate Change a Foreign Policy Priority" and "Prioritized Developing Clean Energy Around the World." It looked back nearly 15 years, citing her votes in favor of a litany of measures such as extending tax credits for renewable-electricity projects, and her cosponsorship (but not lead authorship) of failed bills in 2001, 2003, 2005, and 2007 to curb carbon dioxide emissions and other power-plant pollution. The same day, the online environmental magazine Grist published a lengthy "open letter" to Clinton from Bill McKibben, the Vermont activist whose anti-Keystone campaign has made him a leader of the more insurgent, aggressive wing of the environmental movement. It was somewhat less wordy than the campaign email, and far less bullish on Clinton's commitment to the green movement's central focus these days: achieving deep cuts in carbon emissions by keeping as much coal, gas, and oil as possible unburned. McKibben's "Five reasons environmentalists distrust you," not surprisingly, chided Clinton for her silence on the Keystone pipeline. He also accused the candidate of taking "the Obama administration's affection for fracking and [running] with it," citing a program initiated by Clinton's State Department to help other countries produce shale gas, the stuff tapped by fracking. But McKibben wasn't expressing hopelessness about Clinton, just frustration and modest expectations. His greatest fear, shared by others on the left end of the movement, is not that Clinton will be an anti-environmental president, by any means, but that she'll prove to be a "small-bore, play-it-safe, incremental" one. If she became president, will climate change be as pressing for her as fighting ISIS? In her second presidential bid, Clinton has sent some encouraging signals to environmentalists about where she'll end up—none more significant than hiring John Podesta, the Obama adviser credited with pushing the president's second-term advances in carbon reduction, to be her campaign chairman. At the least, most believe that her presidency would build on President Obama's second term, during which he has made liberal use of executive powers to lower carbon emissions from power plants and reach a landmark greenhouse-gas accord with China. But environmentalists see a historic opportunity in a third straight Democratic presidential term. They want to go big. They don't just need answers from Clinton about her stands on controversial issues; they also need to hear some vision. They didn't get much of either on June 13 in New York. Clinton neither bypassed green issues nor gave them much emphasis. She called climate change "one of the defining threats of our time," vowed to "make America the clean-energy superpower of the 21st century," and took shots at Republican global-warming deniers. Beyond the boilerplate was only the slimmest reed of policy—"using additional fees and royalties from fossil-fuel extraction to protect the environment"—although that was enough to inspire the League of Conservation Voters Action Fund, one of the establishment groups more friendly to Clinton than McKibben's crowd, to give "kudos" to the candidate for "building on her long record of environmental leadership." A protest against the proposed Keystone XL pipeline was held outside 2500 Steiner where Susie Tompkins Buell held a $2,700 a person fundraiser for Hillary Clinton. Billionaire Keystone opponent Tom Steyer earlier held a fundraising lunch for her. Clinton's campaign says she'll begin to roll out her environmental and energy platform later this summer. But for environmentalists, one question might be more important than the particulars of her record and her platform: Does Hillary Clinton have a genuine passion for saving the planet? Will she make climate change a full-throated campaign issue—and, if she becomes president, will it be as pressing for her as fighting ISIS? As folks in the green movement are well aware, not a single major piece of climate-change legislation has even come up for a vote in Congress—much less passed the House and Senate—since 2009. For a president to make serious progress on carbon reduction, it will take a mighty force of will. "She has been an unabashed hero on women's rights issues, reproductive justice, early-childhood health care," says Michael Brune, executive director of the Sierra Club. "As a dad of two little girls, I have a lot of respect and appreciation for what she has done." But he's waiting for Clinton to bring the same intensity to global warming and green energy. "What we need desperately is that same level of commitment and passion and willingness to educate herself and to be bold and ambitious and aggressive," he says. Brune has met with the campaign, which says it has reached out to more than 100 people to talk about environmental and energy issues. But he doesn't sound convinced—so far—that Clinton is ready to lead the charge, even though he says her record has been "great." "We need to rapidly replace dirty fuels with clean energy on a scale that we have not yet seen before," he says. "Doing this will require a degree of leadership that we haven't yet seen from Mrs. Clinton on this issue." THE LAST TIME Hillary Clinton ran for president, dawn had not yet broken on the unexpected oil-production boom that would soon reverse a two-decade decline in U.S. output. The country's natural-gas revolution was just getting started. The rallying cry, for both Republicans and Democrats, was "energy independence," and Clinton's platform reflected the gestalt of the time, emphasizing the dangers of relying on foreign oil (and how those dangers had increased under George W. Bush). She also supported some hefty progressive measures—reducing carbon through cap-and-trade, boosting wind and solar energies and clean-energy technologies. Eight years later, the U.S. is the world's largest oil and natural-gas producer. Obama has cheered and encouraged the boom—though he can hardly take credit for making it happen—as part of what he calls an "all of the above" energy strategy. Basically, it's the idea that U.S. policy should support development of green energy and fossil fuels alike (though the Obama administration has aggressively pursued policies that erode coal's share of electricity production). As a result, environmentalists complain, the administration has lacked a clear mission to achieve the level of carbon reductions that scientists say is needed to ward off the most dangerous levels of global warming. Over the past eight years, environmentalists have grown much less willing to tolerate, let alone embrace, the rise of natural gas, even though it produces far less carbon than coal when burned to create electricity. The fracking methods needed to release the gas, and the emissions of methane (a potent greenhouse gas) that occur when the gas is produced and transmitted, offset some of the carbon advantages. Plus, activists note, the cost of an alternative—renewable power—has been dropping sharply. In 2007, many environmentalists saw natural gas as a lesser evil; now, the fuel is becoming the target of attacks once reserved for oil and coal. The president has been increasingly aggressive on climate change in his second term, most notably with a plan to impose the first-ever mandate on states to cut carbon emissions from coal-fired power plants, which remain the largest unchecked source of industrial emissions. (The plan, which Republicans have loudly decried, will be finalized this summer.) But despite the advances made under Obama, activists are in no mood for another "all of the above" presidency. And that's what some fear Clinton would usher in. "I think we would expect a Hillary Clinton presidency to look a lot like an Obama presidency on climate," says Ben Schreiber of the activist group Friends of the Earth. "It's hard for us to imagine her really dealing with extraction in a way that is more aggressive than the Obama administration has. That, for us, is a giant hole." What would convince Schreiber and his allies that Clinton aims to take more dramatic action than Obama? She could reverse her support for fracking. She could take a firm stand against Arctic offshore drilling—an issue fresh on environmentalists' minds after Obama's Interior Department gave Royal Dutch Shell a preliminary green light to start drilling this summer in Arctic waters off Alaska's coast. She could also break her silence on Keystone. The pipeline needed State Department approval during Clinton's tenure as secretary, and in 2010 she publicly said she was "inclined" to approve it. But after Keystone blew up into the highest-profile environmental fight in years, the department began to slow-walk the approval, which is still officially "under review," and Clinton has declined to offer a position since stepping down, saying it would not be appropriate. Environmentalists also want Clinton to make climate change a centerpiece of her campaign—to fuel the kind of political debate on the issue in 2016 that was largely missing in recent election cycles. Several said they're hopeful that the presence of former Maryland Governor Martin O'Malley and Senator Bernie Sanders of Vermont in the race will help force Clinton's hand. O'Malley, who opposes the Keystone pipeline (as does Sanders), has released an aggressive plan that would expand EPA's carbon-emissions rules beyond power plants to cover other polluters. He takes a dim view of crude-oil exports, and wants to bar drilling off Alaska and the Atlantic seaboard. Sanders, who hasn't yet unveiled his formal platform, has long been a hero to climate activists, a passionate advocate for taxing carbon emissions, among other measures—and he has begun to goad Clinton to take definitive stands. On Face the Nation in mid-July, the senator was asked how he distinguishes himself from Clinton with Democratic voters. After touting his propensity for taking on "the big money interests" and his vote against the Iraq War, Sanders turned to the environment: "I have worked as hard as I can to kill the Keystone pipeline program," he said. "You will have to ask Hillary Clinton what her view is on that. She has not been very clear." IN LATE JUNE, Clinton's former Senate colleague from New York, Chuck Schumer, caused a stir when he engaged in some speculation about a future President Clinton's environmental agenda. The Democrats' Senate leader-in-waiting was addressing a group of people his fellow climate-change foe, Sen. Sheldon Whitehouse, had brought down from Rhode Island for a daylong symposium with lawmakers and federal officials—and a few reporters. While he was giving the folks a pep talk about the Democratic Party's commitment to tackling climate change, Schumer figured he'd dish about the prospects for action if Clinton wins. "Are we on the record here?" Schumer asked. "Can I go off the record, or no?" He answered his own question: "We're off the record." Told that being off the record wasn't really possible, since the event was being webcast, Schumer shrugged it off as the Rhode Islanders chuckled. "OK, well, I'll still say much of what I was going to say." What he said was striking: If Democrats reclaim the Senate majority in 2016, a President Hillary Clinton might put a tax on carbon dioxide emissions. Schumer unspooled a rather elaborate theory about how a carbon tax could emerge as a compromise during a budgetary deadlock—offered by Clinton and the Democrats as a way to raise revenues without increasing income taxes or other corporate taxes. "I think in 2017 people in both parties might come to that as the best way to fund the government," he said. Schumer didn't exactly confirm that Clinton was gung-ho for a carbon tax. But Republican operatives eagerly jumped on his comments, delighted that a leading Democrat had put the words "Clinton" and "tax" into the same sentence. "Folks—Simple Question," began a Republican National Committee email blasted to reporters the next day. "Will Hillary Clinton back a carbon tax, which would dramatically raise energy costs in an already weak economy?" The RNC will have to wait a little longer to find out what policies Clinton will actually run on. Aides say that the campaign is working on an expansive, active process to craft the particulars of her environment and energy platform. It's led by longtime Clinton aide Ben Kobren, who served as communications director for State Department climate envoy Todd Stern; Trevor Houser, an international-energy expert with the Rhodium Group consulting firm; and Peter Ogden, a former State Department and White House climate-change aide under Obama who's now with the liberal Center for American Progress—the think tank founded by John Podesta, Clinton's campaign chief and Obama's environment-whisperer. If Clinton has an environmental ace in the hole, it's John Podesta, her campaign chairman. The campaign says these advisers have reached out to more than 100 experts, ranging from green-energy entrepreneurs to former regulators and governors. I was given a partial list that included some names that would be reassuring to environmentalists—among them, Frances Beinecke, who is a former president of the Natural Resources Defense Council; respected Princeton University climate scientist Michael Oppenheimer; and Carol Browner, who was Obama's White House climate czar and headed EPA under Bill Clinton. It also included Michael Levi, an energy-security specialist with the Council on Foreign Relations who has pushed back against environmentalists' hardening opposition to natural gas. The campaign was less forthcoming about the experts it has consulted in the corporate world, providing none of their names. "We are interested in talking to all stakeholders," the campaign said, "and have had frank and open conversations with oil and gas executives and coal-heavy electrical utilities as well." Tyson Slocum, a longtime energy analyst with the Ralph Nader-founded advocacy group Public Citizen, says the roster of advisers provided to National Journal only reinforces his suspicion that a Clinton presidency would mean no "big deviation from the path that Obama has charted." Slocum, a critic of Obama's support for expanding natural-gas exports, noted that Houser recently coauthored a paper in favor of relaxing the decades-old ban on crude-oil exports. "It sounds like, for the most part, a kind of Democratic-leaning, mainstream hodgepodge of folks that will most likely advise Clinton on kind of a continuation of the current path," Slocum said. Levi cautions that it's virtually impossible to predict how a President Clinton's policies might evolve, whatever she says during the campaign. "Even if you would have known all of Barack Obama's principles in 2008," he says, "you would have been able to predict very little of what he actually did on energy and climate. And that is because the energy world and the economy fundamentally changed." Clinton's State Department record provides some clues to how she might lead as president. She created a special envoy for climate change, and helped to launch a multilateral initiative in 2012 to cut emissions of several pollutants that worsen global warming. Ogden, who worked under her at State, touts the 2010 launch of a Global Alliance for Clean Cookstoves as an example of how Clinton combined her longtime interest in children's and women's health with her concern for combating climate change. The program helps reduce poor countries' use of traditional stoves fueled with wood, dung, coal, and other solid fuels; that's a big public-health problem in the developing world, but cleaner stoves also help the battle against climate change. "She had a really strategic approach to bringing and finding ways in which you could move multiple issues forward simultaneously," Ogden says. And she did it, he emphasizes, during a time when climate change was not a top White House focus—the period after climate legislation collapsed in Congress in 2010 and before Obama announced his muscular second-term agenda. "It was a different political environment," Ogden says, "and it was a different kind of challenge to continue to build momentum for these issues and to keep it alive as she did over those four years." This image can only be used with the Ben Geman piece that originally ran in the 7/18/2015 issue of National Journal magazine. But what activists who are suspicious of Clinton remember from her years as secretary of State is the way she punted on Keystone, and her friendliness toward fracking for natural gas. In 2010, the department launched the Global Shale Gas Initiative to help other nations develop the resource. According to State, it was a way to give allies technical assistance, including environmental safeguards, to help them diversify their energy supplies with a fuel that's less carbon-heavy than coal. Some environmentalists, however, saw the program (rechristened the Unconventional Gas Technical Engagement Program in 2012) as an attempt to spread fracking across the globe that would benefit private energy companies—and one more reason to question how much Clinton could be trusted as an ally. IF CLINTON HAS an environmental ace in the hole, it's John Podesta, perhaps the most powerful figure in American politics whom environmentalists see as one of them. When I was first trying to find out who was advising the campaign on climate and energy issues, one of the people I asked was Julian Boggs of the liberal group Environment America. His reply: "God, I hope John Podesta." Unlike his current boss, Podesta has long been on record against both Keystone and Arctic drilling. His presence at the top of the Clinton campaign's hierarchy is a hint of policy in its own right. When I interviewed Podesta by phone at the end of June, he wasn't about to get ahead of the campaign's coming rollout of Clinton's energy and environmental platform. But in his first extended comments on the campaign's approach to these issues, Podesta suggested that as president, Clinton would continue Obama's efforts to cut harmful emissions—and that she would do it largely the same way, by mining the president's "enormous authority" to act without Congress. "I think we want to build on Obama's substantial record in trying to use existing authority to move forward," he said. "You have to look at all sources of emissions: in the transportation sector, in the electricity sector, in the built-space sector, in the industrial sector." The campaign is also working, he said, to find new ways to help states that want to go beyond Obama's mandated cuts on power-plant emissions. With the current Republican-controlled Congress, Podesta said, there's little option but executive action, though he held out some hope for bipartisan collaboration on clean-energy tax incentives. "I think, in the short term, the chances of this Congress becoming a real partner with an administration that wants to both attack the problem and build the opportunity [are] small," he said. He acknowledged that reality limits the chances of advancing a big, sweeping policy idea through Congress. When I asked Podesta about Schumer's carbon tax suggestion, he brushed past it, though without rejecting the idea outright. "We will lay out our policy over the course of the summer," he said, but added: "Senator Schumer speaks for himself, not for Secretary Clinton." Advocates of aggressive steps on climate change are investing a lot of faith in Podesta. Henry Waxman, the former House Energy and Commerce Committee chairman, told me he plans to endorse Clinton. Waxman, who made the environment and climate change a huge focus of his decades in Congress, coauthored the successful Clean Air Act revisions of 1990, and later steered a massive cap-and-trade bill through the House in 2009. (It stalled in the Senate.) Asked if he's confident that Clinton will be a warrior on climate if elected, Waxman waxed optimistic—and immediately brought up Podesta. "I feel very hopeful that she will," he said. "I haven't talked to her directly, but I think John Podesta has talked to her about a lot of different things, and he is well versed on the climate change issue ... and I am sure will have an important influence on her." While Podesta steered clear of policy details, he was emphatic about what's to come in 2016. "This will be a front-and-center issue in the presidential campaign," he vows. That would be a break from past election cycles, when climate and green energy made only cameo appearances, but Podesta said this time will be different, partly because of the shifting political landscape. "Politics is all about friction," he said, and there's plenty of it between Clinton and the GOP field, which is heavy on candidates who question or outright deny human-induced climate change, and who uniformly oppose Obama's new power-plant rules. "That is a very, very different perspective than the one Hillary Clinton holds," Podesta said, "and I think that you will see this, particularly in a general election, squarely debated." He said the campaign is eager to have that debate. "I think that the Republicans are in a position where they are going backwards not forwards," Podesta said, and he thinks their biggest financial backers won't help. "They will have to carry the money that is backing them up from the Koch brothers and the coal industry, et cetera, and explain to the American people why they don't want to do anything about this problem." But can carbon reduction and green energy be winning issues in a presidential election? Polling cuts both ways. Surveys in recent years by the Pew Research Center consistently show that when Americans are asked to name topics most important to them, climate change comes in at the bottom of the list. But ask voters questions about global-warming policy, and the answers favor action—often strongly. (An ABC News/Washington Post poll released in June of 2014, for instance, found 70 percent support for limiting greenhouse gases from power plants.) If the Clinton campaign does make the environment a driving force in the campaign, it will be a political experiment. Of course, contrasting herself with Republicans on climate and energy won't likely be enough to mollify restless environmentalists worried that Clinton will take a go-slow approach at best. Certainly, if Clinton wins the nomination, the green movement will back her against any Republican. Whether environmentalists will ultimately view a Clinton administration as a historic missed opportunity, however, is harder to know. A few days after I spoke with Podesta, the liberal Nation magazine issued the Democratic candidates a challenge: Vow you won't take any money from oil, gas, or coal companies. Sanders and O'Malley agreed. Clinton did not respond.